Rhinoplasty, or nose job, is a procedure performed to correct the shape and in some cases the functionality of the nose. There are many reasons a person might seek rhinoplasty as a corrective measure beyond simply aesthetic enhancement purposes, though this is certainly a common reason for seeking the procedure in and of itself. You may have a nose that isn’t proportionate to the rest of your face. Your nose may be too large or too small. Your nasal bridge might have a bump. Noses are intricate creations, which lead to distinctions, some more welcome than others. Through the rhinoplasty procedure, Dr. Layke can change the shape of your nose and nostrils. * We can give your nose contour and balance, changing the dynamics of your face drastically, if that is the ambition. Whether the procedure is cosmetic or has functional benefits to the patient, Dr. Layke performs the rhinoplasty procedure with precision and craft. So who is the right candidate for a nose job at Beverly Hills Plastic Surgery Group? You may be a qualified candidate for rhinoplasty if you’re unhappy with certain qualities of your nose. It can be anything from structure and shape to size. You might have trouble breathing, which would also make you a fine candidate for this specialized procedure. We can talk more about it during your initial consultation, which we can schedule anytime. If you have questions about rhinoplasty, please read on, as we go further into the preparation and actual nose job procedure. Dr. John Layke is a double board-certified, Patient’s Choice Award-winning plastic and reconstructive surgeon in Beverly Hills, specializing in the rhinoplasty procedure. He’s half of the driving force of Beverly Hills Plastic Surgery Group alongside Dr. Payman Danielpour for over 7 years and counting. He trained at Nassau University Medical Center in plastic and reconstructive surgery and completed his General Surgery Residency Program at the University of Illinois Metropolitan Group Hospital. Dr. John Layke has been published multiple times over in notable journals and has appeared on Vanderpump Rules, Extra, Home & Family TV, and Entertainment Tonight. Dr. Layke strives to combine cutting-edge technology with advanced, personalized procedures that blend science and craft, creating a custom-tailored aesthetic enhancement experience for each individual patient. There are many variables that go into rhinoplasty cost. Since no two noses are the exact same, we will custom-tailor the pricing to suit the work that needs to be done. You will never have to pay for one-size-fits-all rhinoplasty work with Beverly Hills Plastic Surgery Group. Generally, rhinoplasty is considered cosmetic work and will likely not be covered by insurance providers. Septoplasty can often be paired with rhinoplasty, which entails correcting the septum when the patient is having trouble breathing. If a septoplasty is being considered, your insurance provider may very well provide some amount of coverage for this aspect of the procedure. To learn more about cost and rhinoplasty financing, contact Beverly Hills Plastic Surgery Group. We’ll walk you through the process and can even arrange a tour of our facilities, including the brand new Stitch Surgery Center. We’ll spend a significant amount of time with you, discussing the qualities of your nose you would like to address. Together, we’ll cultivate realistic yet ambitious goals, working to achieve the look and shape that you desire after your nose job. Communication is always key, and that’s how we’ll foster achievable goals together. We will never mislead you. We’ll treat you with dignity and honesty. We’ll show you our before and after photos which attest to the results that Beverly Hills Plastic Surgery Group is capable of. * Dr. Layke always prefers to aim for a more natural look instead of performing procedures that yield a “worked-on” sort of aesthetic. 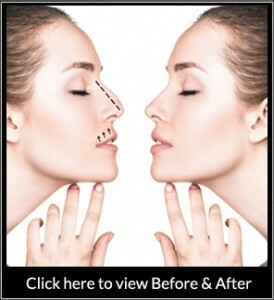 A nose job or rhinoplasty by Beverly Hills Plastic Surgery Group can be broken down into two categories. Open rhinoplasty and closed rhinoplasty. Open Rhinoplasty — Involves a precise incision along the columella (cartilage separating the nostrils). From this position, skin can be lifted, exposing the underlying structure of the nose, which Dr. Layke can skillfully reshape and resize. This method generally yields more drastic changes. Closed Rhinoplasty — Incisions are made inside the nose only, through which Dr. Layke can reshape the nose accordingly. This method is generally reserved for more minor changes. Both open and closed rhinoplasty are extremely effective procedures when done at Beverly Hills Plastic Surgery Group with Dr. John Layke. Once we’ve met with you and finalized realistic aesthetic enhancement goals, we will determine the right procedure for you. We pride ourselves in offering a custom-tailored experience for each individual patient. As with any surgical procedure, we encourage you to plan for some downtime. This might be a great time to catch up on some podcasts or binge watch some Netflix. The first week will be very important, at which time we strongly suggest you protect your new nasal structure. There are several ways that you can help reinforce your body’s healing processes. Wearing button-up shirts is a start, that way you’re not pulling any fabric over your nose multiple times per day. Sleeping with your head elevated and making sure to eat soft foods or even opt for a smoothie diet for the first week will give your nose the room it needs to heal. Avoid salty foods or spicy foods, because you want to also avoid blowing your nose. Taking baths instead of showers will also help facilitate the healing process. It’s perfectly normal for you to experience some bruising, swelling, and nasal stuffiness or congestion. It might make you a bit uncomfortable, but we’ll do everything we can to ensure a most comfortable transition, prescription medication included. Of course, if you experience anything beyond discomfort, such as intense pain, bleeding, or especially if you experience an injury to your new nose, please contact Beverly Hills Plastic Surgery Group immediately. We’ll give you all the support you need with intensive follow-up services. We’ll assess your progress and make sure that your body is healing properly. Dr. Layke makes it a point to be very interactive with his patients before, during, and after the nose job procedure. Contact Beverly Hills Plastic Surgery Group today. Dr. Layke and Dr. Danielpour work side by side to ensure patient safety and satisfaction. We use cutting edge technology and brand new facilities to make every procedure unique and special to the individual. Call now to learn more about the ways that our rhinoplasty procedure can benefit you.